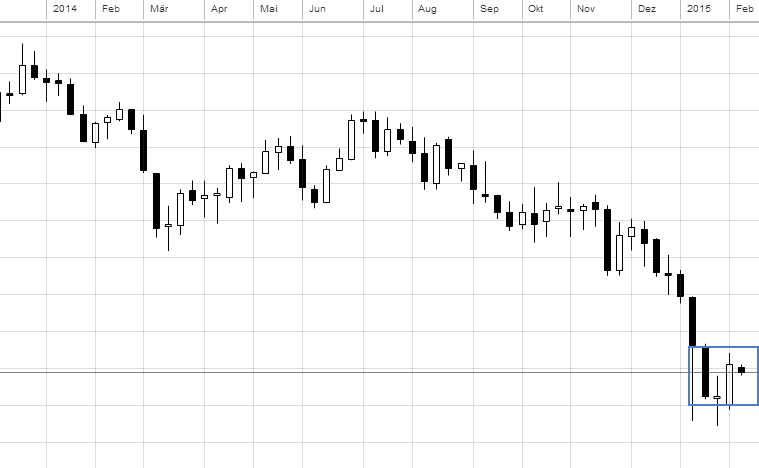 Besides of the WTI Crude Oil COT Report we should also consider a look into the COT Report for Brent Crude Oil Futures and Options combined as well as NYMEX and ICE combined. With that said, we can see a total Open Interest of 2,663,517 of which Managed Money is long positioned with 269,674 contracts and short positiond with 114,800 contracts makes a net long position of 154,874 contracts. 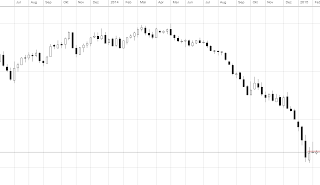 Money Managers were net buyers of 15,046 contracts with a long liquidation of 2,062 contracts and a short covering of 17,108 contracts in the week ended February 10, 2015. To fine tunning our technical analysis it is a good idea to explore some other markets, out of curiosity and diversity as well as to sharpen our senses. The concept of thinking outside or inside the box appeals here as well. It does not mean to trade an other market or something but to go out and playing around like a kid is always a good idea in our opinion. With that said, let's check out the Orange Juice market! It is very important to read and understand the bigger picture of a market. It is not funny to stick around with a piece of a puzzle. You will play the whole game and have much more fun with all pieces altogether to create the big picture. 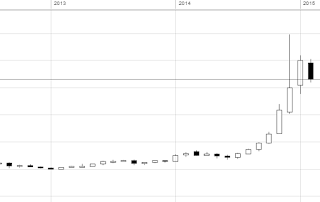 So here we go again with the monthly macro perspective as usual. We can see a price channel, the installed Fibanocci retracement tool and a lovely bracket area on this timeframe. 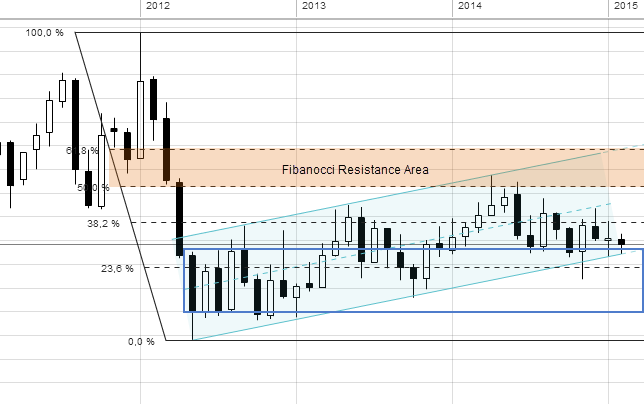 The market rejected the 50% Fibanocci level that was confluent with the price channel's high. 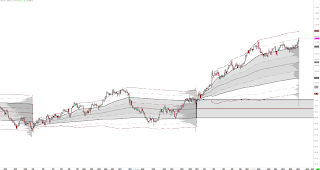 Currently the market is testing the lower area of this price channel that is actually confluent with the drawn bracket area high. 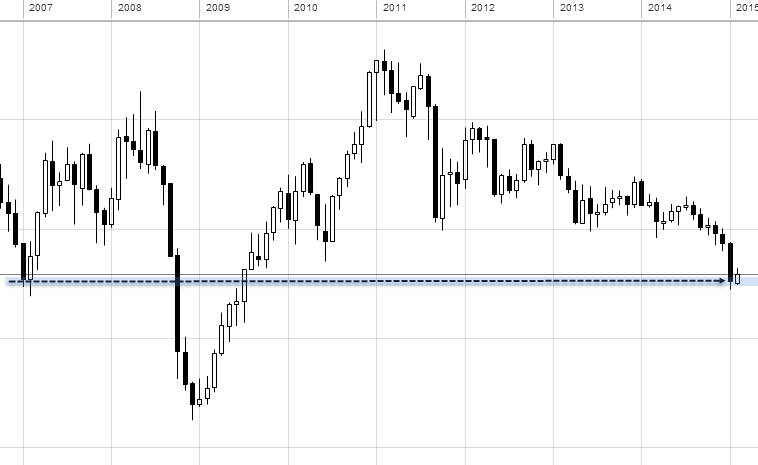 A break should lead us to some lower prices again. 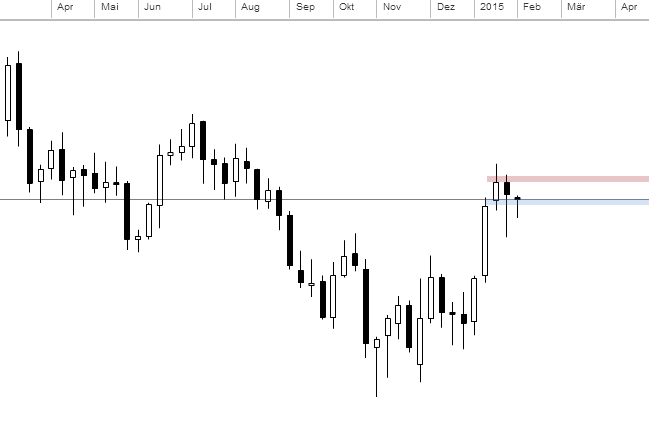 We keep it simple with the weekly bars chart. The market broke out of its actual balance area and moved into the previous micro bracket area with support at the balance area's bottom. The previous week was an inside bar, so we have a rotational balanced market here. Looking at the daily bars chart, we can see the support at the 61.8% Fibanocci level and the current balanced behavior with a the recent test of the bracket low. 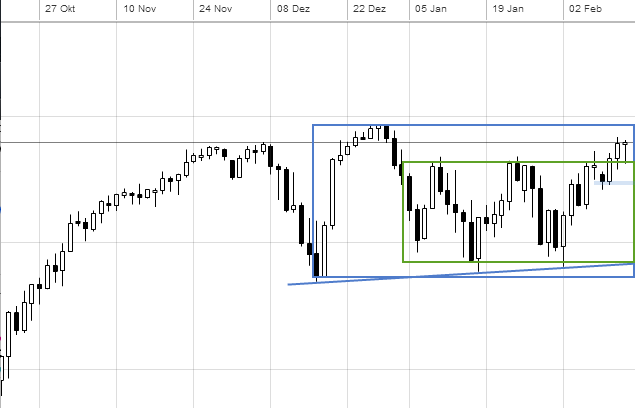 With this information the market could see some higher prices to test the daily bracket area high for example. Actually there is also a wedge to keep an eye on. 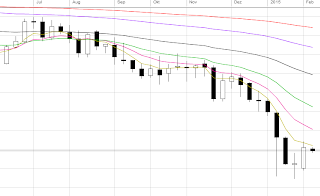 With installed EMAs on the weekly timeframe, we can see that the market is trading below all six EMAs. 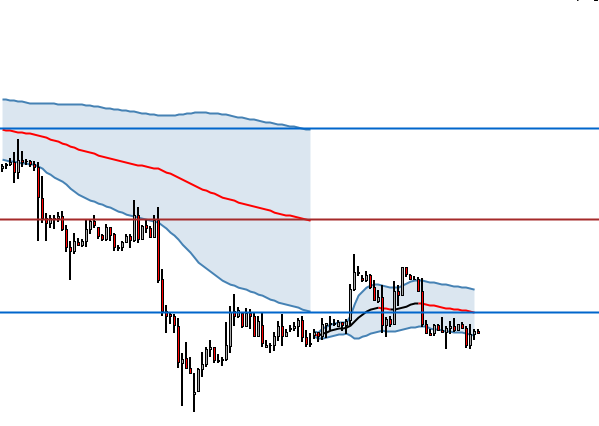 Looking at the daily EMAs, we can see today's break of the first two short-term trend EMAs, so a test of the 20EMA should be possible. We'll see how the market will react to the mentioned levels. Stay open minded as everything can happen. 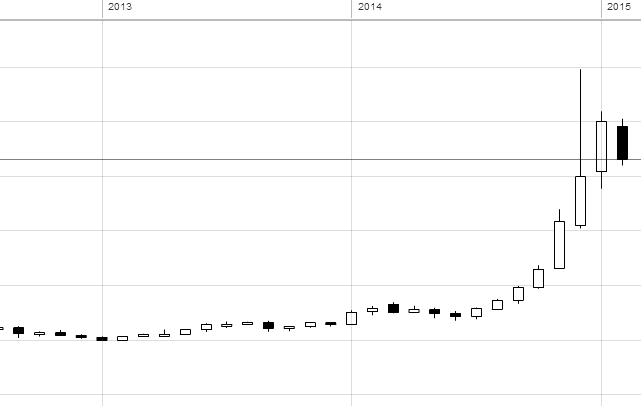 Let's take a updated technical look into the USD vs RUB market. 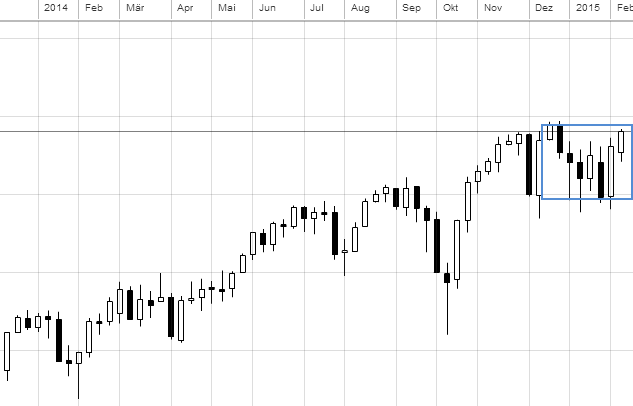 As usual, we start out with the plain monthly perspective to better understand the macro market structure. Looking at this timeframe, we can see a one time framing higher market. 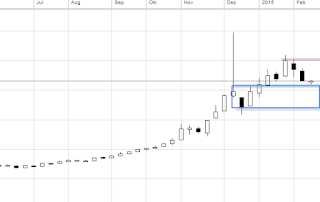 We see a selling tail candle followed by two inside months so far. 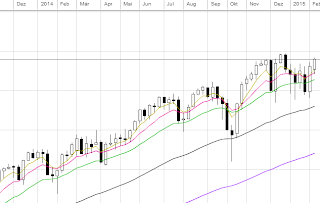 Means the market is in a balanced state on this timeframe currently. Moving forward to the weekly bars chart, we can observe that the last week ended the one time framing higher behavior as it took out the lows from the previous two weeks. The previous week's low got taken out as well today. 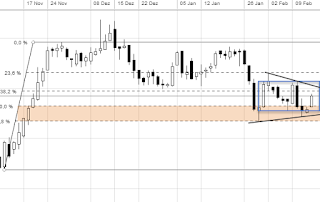 We also marked some potential support/resistance levels that could help to form a balance area here. We'll see. Now looking at the daily perspective, we can see some more details. 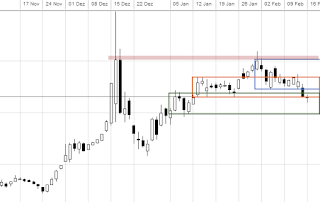 The market nicely stopped at the marked resistance level and balancing lower now. 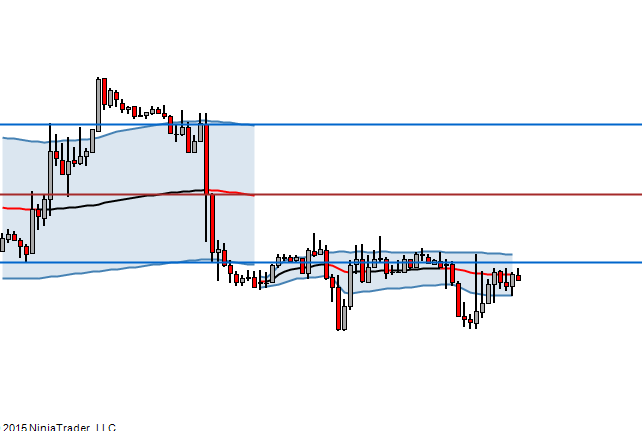 We can identify several balance areas on this time timeframe. Currently the market seems to have some support at the orange bracket low but got back into the green bracket at the same time. 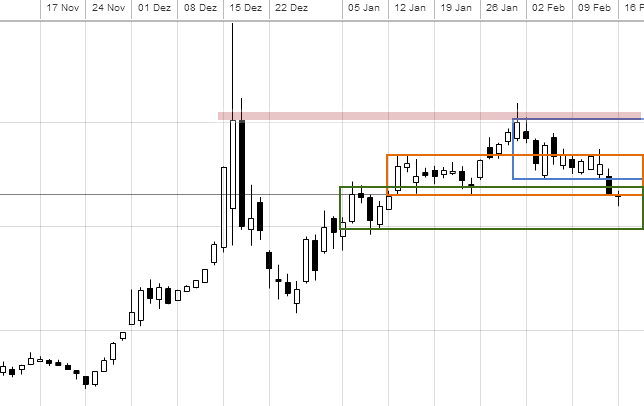 Potential scenario could be a test of the green lows or a move back to the orange highs again. However, the daily bars chart is one time framing lower, so a break of today's high could lead the market back to the orange highs but bear in mind the green bracket high. We know... confusing situation here but it's only some analysis nothing more or less. Let's check also the EMAs. The current week trading below the month's average but seems to have some support at the 10EMA. 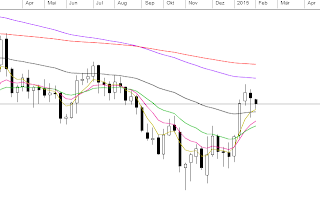 The daily perspective actually broke the three short-term trend EMAs to the downside and today's market seems to have tested the first long-term EMA 50. As mentioned a end of the daily one time framing lower behavior could lead us higher again. 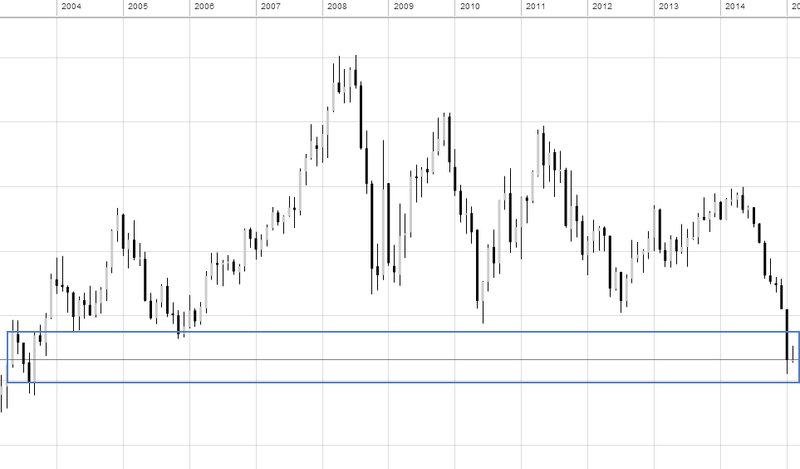 A non-break should lead us lower to the mentioned green balance area lows. We'll see. The Composite US Natural Gas Futures and Options combined as of February 10, 2015 shows a Total Open Interest of 3,906,030 of which Managed Money is long positioned with 365,330 contracts and short positioned with 415,345 contracts makes a net short exposure of 50,015 contracts. We can see a long liquidation of 10,816 contracts and an increase in short positions by 8,261 makes Money Managers net sellers of 19,077 contracts in the week ended February 10. Looking at last week's COT Report for WTI Crude Oil Options and Futures combined as well as NYMEX and ICE combined, we can observe a total Open Interest of 3,474,449 of which Managed Money is overwhelmingly long positioned with 342,819 long contracts and 119,517 short contracts. 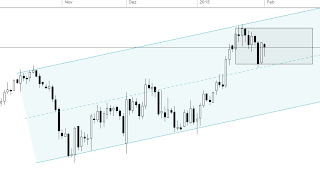 We can see in the Managed Money section a long liquidation of 11,346 contracts and a short covering of 12,147 contracts makes a net buying of 801 contracts in the week ended February 10. 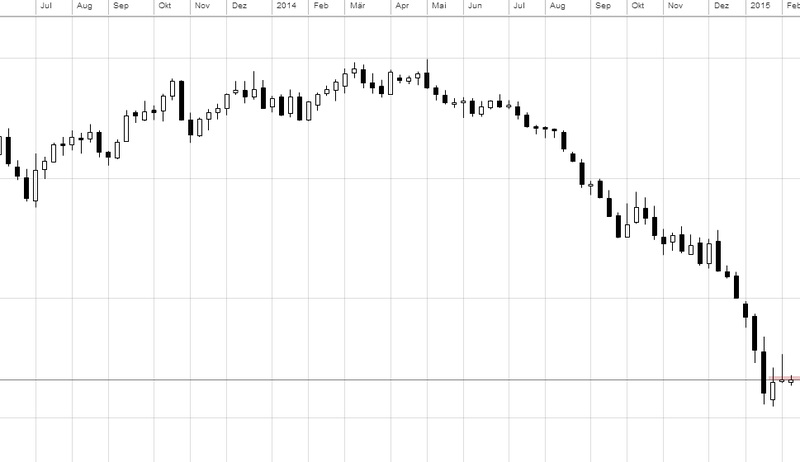 Altogether the US Total Petroleum (RBOB Gasoline, Heating Oil etc.) Futures and Options Combined as of February 10, 2015 shows a Total Open Interest of 4,302,505 of which Managed Money are long positioned with 463,419 contracts and short positioned with 219,013 contracts. In the week ended February 10, long positions decreased by 12,801 and short positions decreased by 11,896 with net selling of 905 contracts. Next to the 10 Year Treasury Note contract the E-mini S&P 500 contract [ES] is the most liquid futures contract that currently exists. With that, we should take a quick look into this market with our top down analysis process. In this process the first piece of information is the larger picture Monthly bar chart to understand the macro behavior of the selected market. 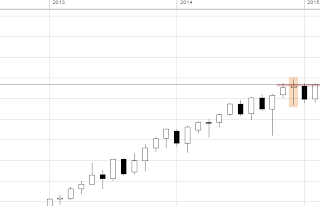 Looking at this monthly bar chart, we can see a heavy bullish imbalanced market. 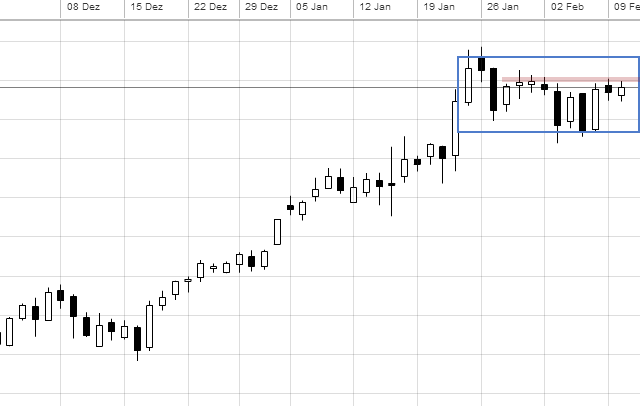 Obvious is the outside bar that could be a first sign of change in market context. 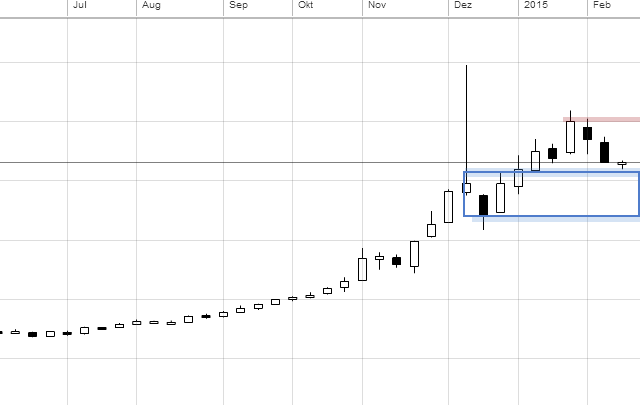 However, the previous month was an inside bar and the current month seems to break higher. Currently the market is testing the marked resistance level. We'll see what will happen here. 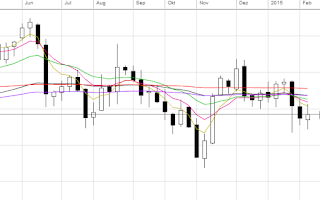 The weekly chart is heading towards to the drawn bracket area high. The daily perspective showing this balanced behavior in a more clear and greater detail. Currently the market is one time framing higher in this balance zone and moving forward to the bracket high. It will be interesting to see where this market will break out. 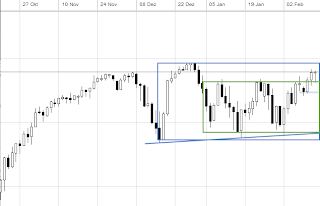 The market could find resistance at the daily/weekly bracket high to return to lower areas again. However, a stop-run scenario to higher areas is possible as well. You can find more indepth analysis with VWAPs and TPOs on our trading community. This top down perspective was only a quick heads-up analysis. 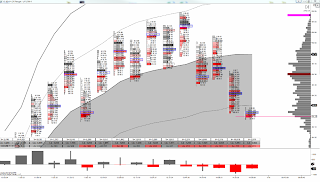 With the elite membership on our trading community you are also able to download The Private Banker chart templates for Sierra Chart as well as NinjaTrader inclusive indicators like VWAP or the Footprint (Volume By Price) chart. Sierra Chart have been kind enough to offer our elite members a discount as well. We are not entirely sure how much and how this works yet, but they have just provided us with a link. Update: Sierra Chart offers our members a 25% discount. To apply this discount you need to open a new Sierra Chart account with the link we provided in this thread. Also, if you want the discount please send up an email with your username as you have to be an elite member or premium member on our trading community. And don't forget: You will need also a data-feed! 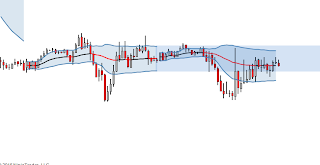 We also offer a NinjaTrader Workstation inclusive VWAP, Volume at Price tool etc. However, for the TPO Profiles you will need to buy a license from Fin-Alg. If you have any questions, please don't hesitate to ask us via e-mail. 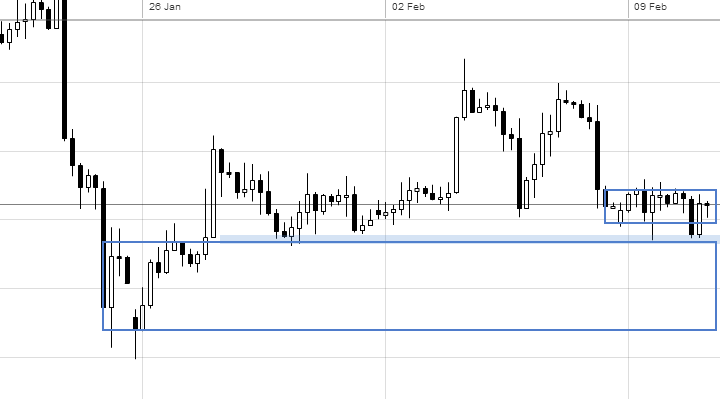 Yesterday in our EUR/USD Market Update we mentioned the stubborn support level... and it still holds. Today the market tested again that level inside of the daily balance area and could not continue to move lower. 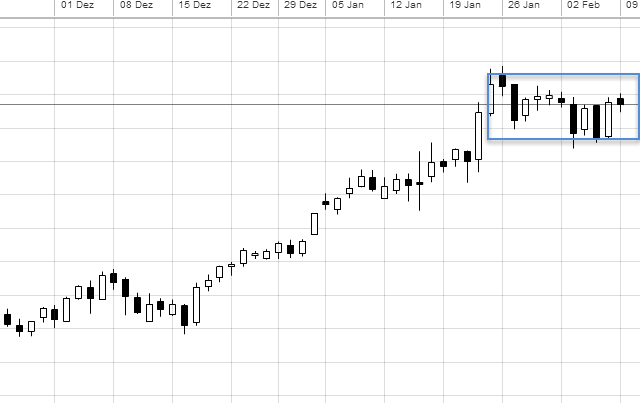 Same picture for the US Dollar Index that is trading inside of a bracket with a resistance level. 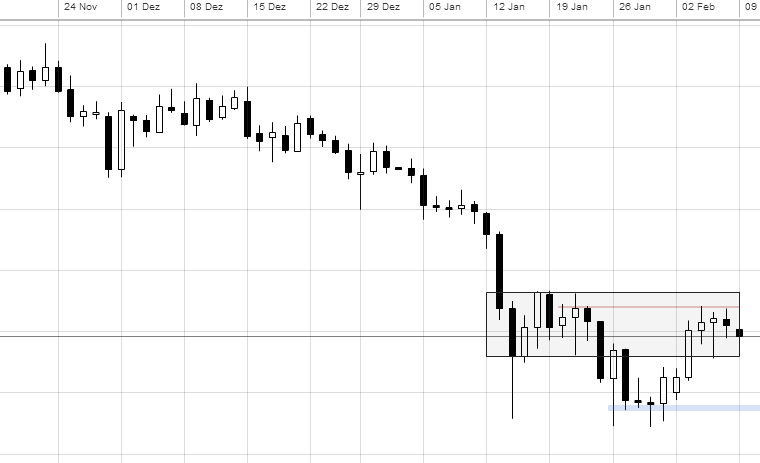 With looking at the weekly TWAP, we can see that the market has been rejected several times from the previous week's VAL close level. The market is trading in a rotational behavior here as well. 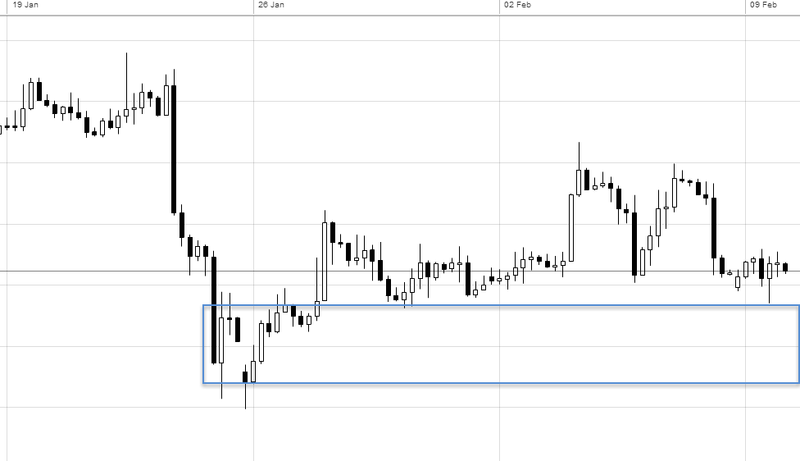 Moving forward to the intra-day TWAP, we can observe resistance at the previous day's VAH close level and a small selling imbalance in the London session. However, the market found support at our persistent level and lead the market back into the developing value to quiet down a bit. As said, there is still plenty room for the downside. 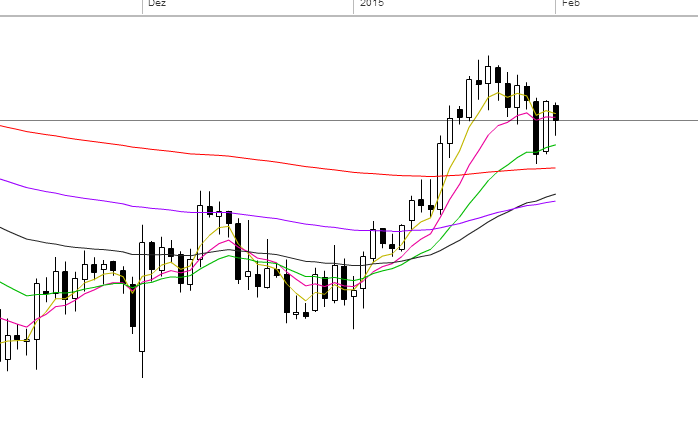 The US Dollar Index seems also ready to test the daily bracket area high. 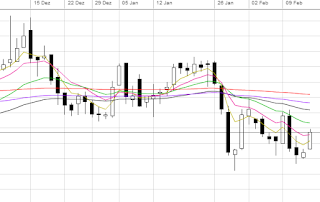 Anyway, firstly and foremost the market have to breakt the mentioned levels. Keep it simple and be open minded for every scenario. 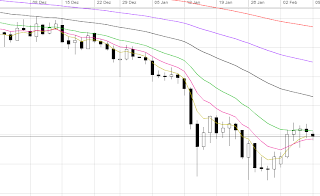 After some wild days for the EUR/USD currency pair let's take an updated look into this market. As usual, we going trough our top down analysis process to better understand the market structure and to form some possible conclusions as well as potential scenarios. Starting off with the macro perspective, we can cleary observe an imbalanced market that one time framing lower since several months. 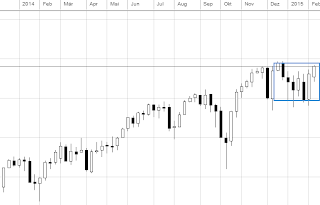 This month the market opened inside of a balance area that occured back in 2003. We'll see how the market will behave at the bracket high/low. Let's keep an eye on that levels. 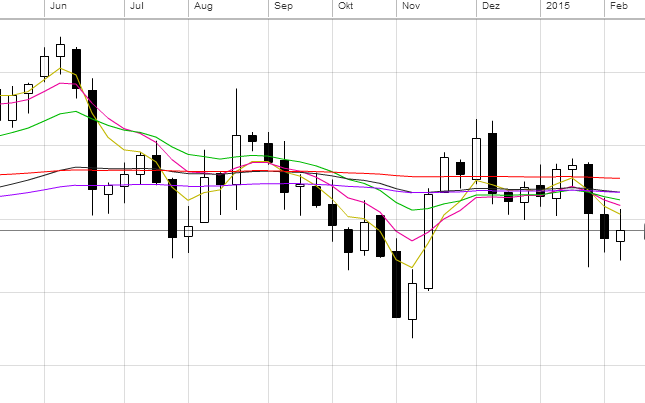 Also with the weekly chart, we can see a very selling imbalanced market. 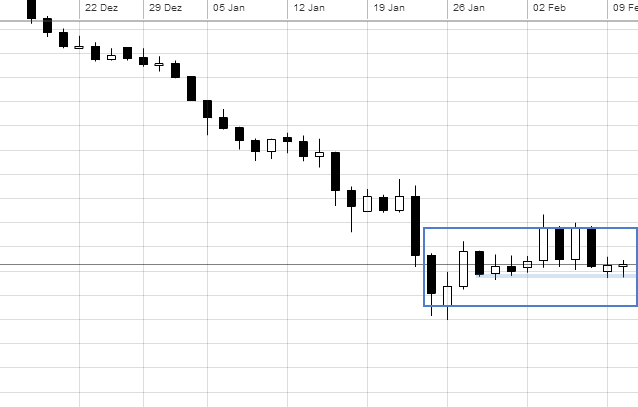 The previous week ended the one time framing lower condition in some degree but bear in mind that the previous week actually closed below the week's high and formed a potential resistance area. The likelihood of testing the low again should be high. 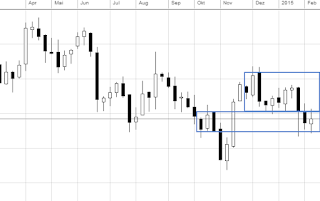 Moving forward to the daily bars chart strengthens our short conclusions as we can cleary see a balanced market condition here. 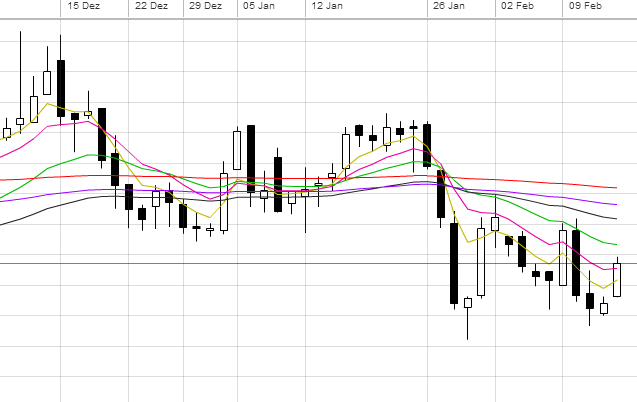 There is lot of air to the downside but the market have to break a stubborn support level inside of this balance area that holds since several days like in today's market as well. 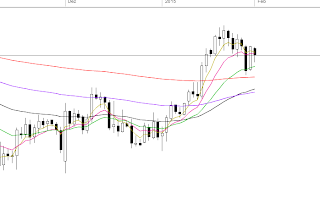 Last but not least is to take a look into the US Dollar Index. Here we can see a balanced behavior in the daily perspective with a potential test of the bracket high conclusion. 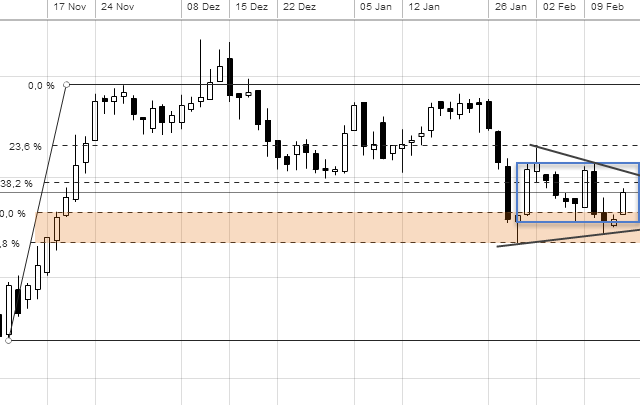 If the market could break this mentioned support level inside of the daily balance area we should see some lower movements to the bracket low. As we know the currency market is sometimes a uncertain area with wild swings, so look out and calculate as well as manage your risk with the highest attention. Next time we will take a look with TWAPs on this market again. 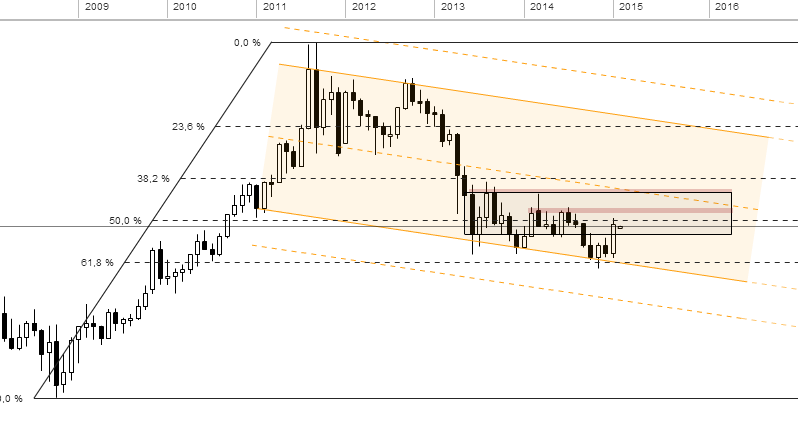 Last time we covered the beast metal market Gold. 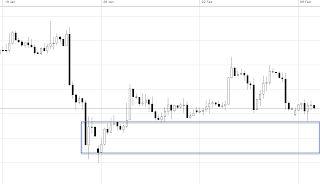 Today we will show our technical top down perspective on Copper (Cash Market). We are going through the various chart time periodicities to get a feeling for the overall market context and the path of least resistance. To accomplish this we are using the simple concepts of AMT (Auction Market Theory) and the understanding of balance and imbalance. 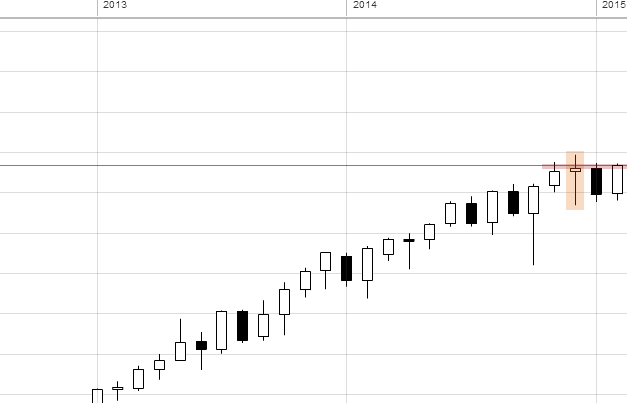 With that said, let's start out with the monthly bars chart that is one time framing lower since 6 months. The actual new month is an inside bar so far. 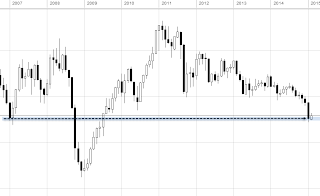 There is plenty of air to the downside but we are identiefied a potential support level that is marked on the screenshot below. We'll see what will happen here. Moving forward to the weekly bars chart, we can see a possible forming of a balance area as the previous week ended the one time framing lower behavior that occured since several weeks. A break above this bracket area could lead us finally to higher prices. 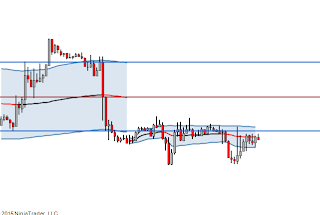 However, the macro is still imbalanced to the short side, so we'll see how the market will react in this area. 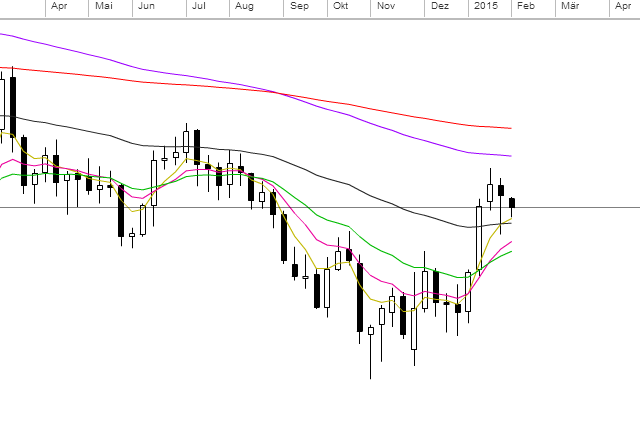 As with the weekly bars chart we should consider a look with EMAs here as well. The market broke the first two short-term EMAs and got rejected by the 20 EMA (green line). 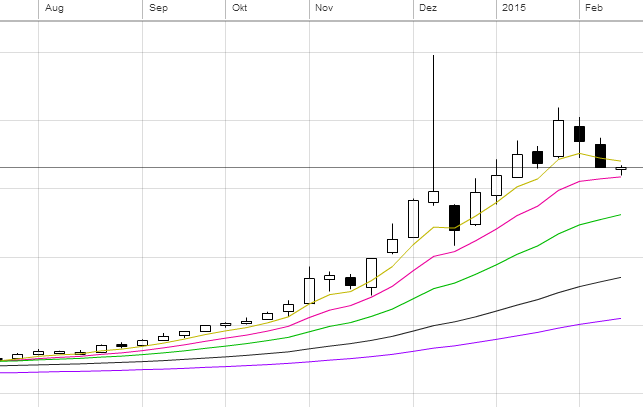 So we have possible support at the week's average (5 EMA). Bearish long-term trend is still intact. 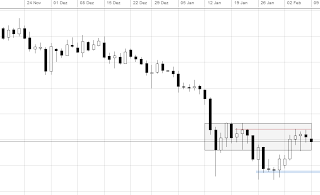 With this quick analysis and the state of the market we could conclude a possible move towards to the downside. Anyway, as usual everything is possible and we should be open minded for other possible scenarios as well as using some other analysis tools to better understand the told market story. Stay happy because success is only a habit! With looking at last week's COT Report Options and Futures combined as well as NYMEX and ICE combined, we can observe a total Open Interest of 3,459,029 of which Managed Money is overwhelmingly long positioned with 354,165 long contracts and 131,664 short contracts. Long positions decreased by 4,248 longs and short positions increased by 2,219 shorts makes Money Managers net sellers of combined 6,467 contracts of WTI Crude Oil in the week ended February 3. The 'Other Reportables' (Retail Traders) are also more long positioned with 209,519 long contracts and 60,018 short contracts. In the week ended February 3, long positions decreased by 17,990 and short positions decreased by 16,750 makes the 'Other Reportables' net sellers of 1,740 contracts. Here is the COT Report for the week ended February 3, 2015. 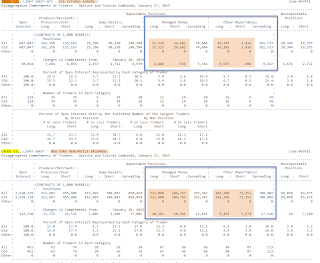 Learn more about Open Interest and the COT Report. It is our pleasure to announce that The Private Banker is officially a TalkMarkets Contributor now. 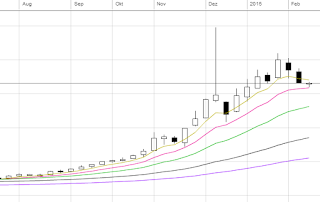 TalkMarkets is a new financial media site launched by former executives from Seeking Alpha and Bloomberg. It is a smart site which covers the entire breadth of the financial industry but with content customized to user's interests, preferences and level of investment sophistication. This provides users with a unique experience which is quick, easy and personally relevant. Of recent, Mr. Mark Cuban, the owner of the Dallas Mavericks and one of the investors on ABC's Shark Tank has joined the site as a contributor alongside hundreds of other famed authors including, Doug Short, James Altucher, Robert Reich, James Hamilton, Tyler Durdan, Peter Schiff, and Michael "Mish" Shedlock. We are happy to contribute to this great idea and be part of this financial-information website. Thank you! The Commitments of Traders reports are released at 3:30 p.m. Eastern time. The Futures Only reports and Futures and Options Combined reports are usually released on Friday. The release usually includes data from the previous Tuesday. Federal holidays may delay release by one or two days. With that, we know the reports provide informations of each Tuesday's (weekly) open interest and usually relased on a Friday. But what is open interest? 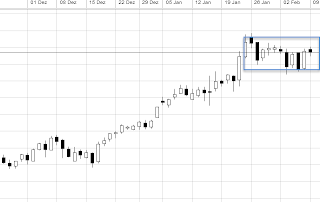 Note: X closed one short position of his 3 shorts and S closed his long position, while Y still holds three open long positions and R one short position. 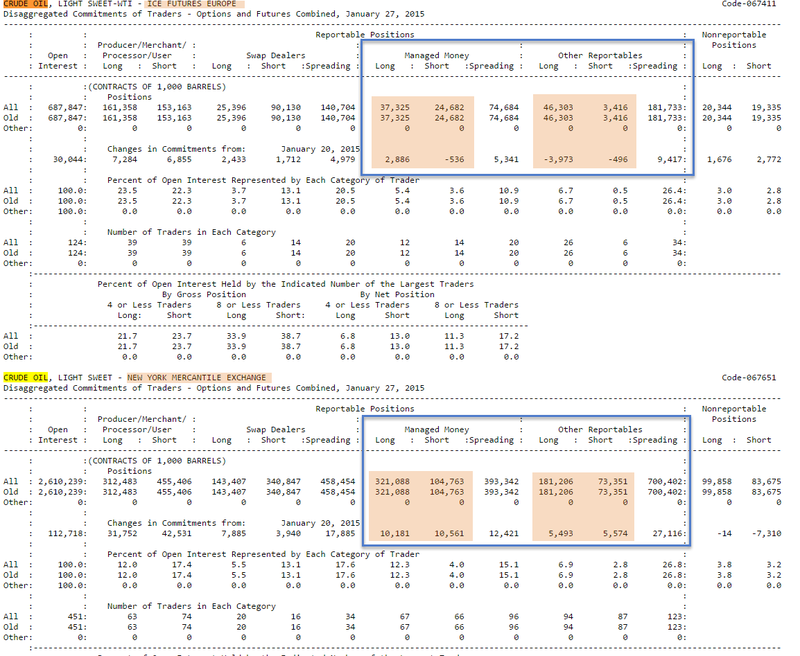 So, we have three open longs and three open shorts in the market makes a open interest of 3 as the total of all long open interest is equal to the total of all short open interest. 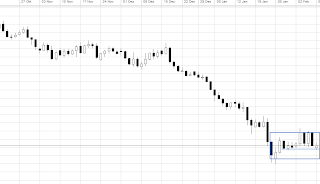 Let's assume we would like to analyze the report for the WTI Crude oil market (Petroleum and Products). 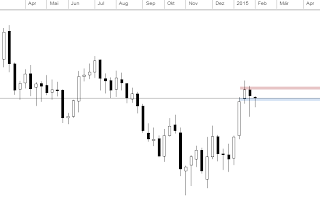 Firstly we consider to keep an eye on the Futures and Options Combined Long Format report. 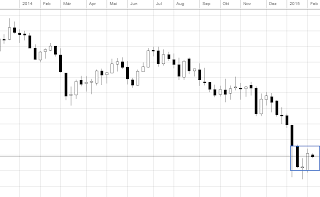 Secondly we combine the NYMEX and ICE data. Why? Why should we leave out all the beautiful data and looking only at some Futures data? Here is a screenshot form the COT report for WTI Crude oil with the week ended January 27, 2015. Tip: You can use CTRL+F to find the Crude Oil section rather than scrolling around. Put the two together, we can see a open interest of 3,298,086. You should keep the closest attention to the 'Managed Money' section as this represents professional related guys such as hedge funds. Now with looking at this, we can observe an increase by 13,067 long positions and an increase by 10,025 short ppositions (NYMEX + ICE). 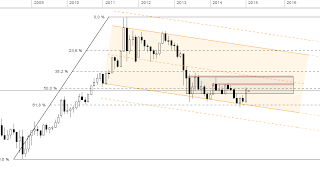 This makes a managed money net buying of 3,042 long contracts in the week ended January 27, 2015. 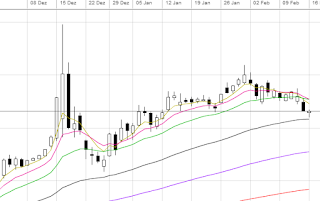 Additionally we can see that the managed money is positioned more to the long side with a ratio of 3:1. It will be interesting to see the number of closed short positions in the next report that will be released on this Friday. Because of all the short covering and stop runs the number should be huge. We'll see. Anyway, stay open minded and happy as success is a habit! 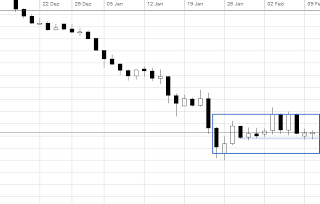 Moving forward to the weekly chart, we can observe a one time framing higher market that occured for three weeks and ended in the previous week. 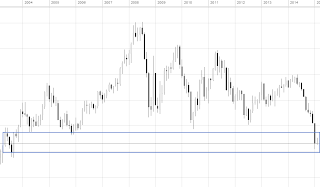 Technically is a rotational market behavior between the two marked support/resistance levels possible. Bear in mind that this market is a beast and could break these levels with ease. 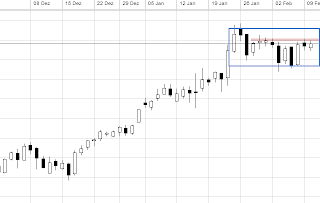 Looking a the daily perspective, we can observe a bullish channel and a potential balance area. 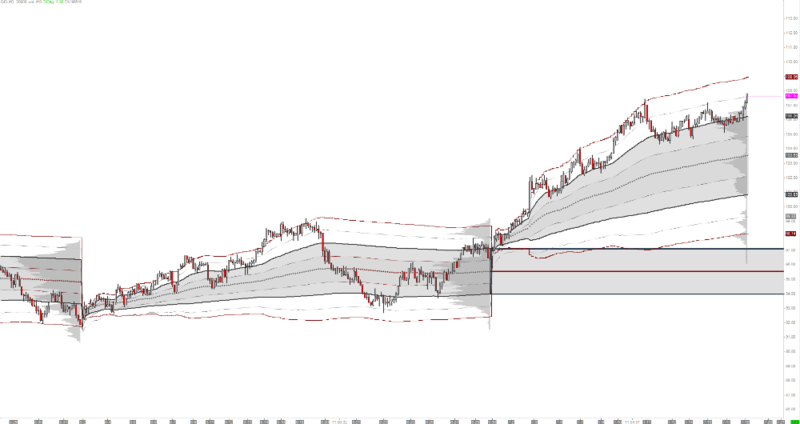 The chennel's bottom served several times as support and brought the market to the upper level of this channel. 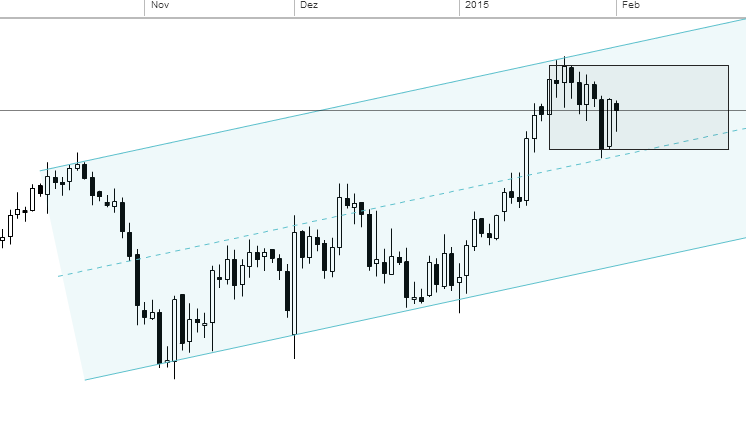 Two days ago we tested the channel's mean and yesterday we found support to close as an inside bar. 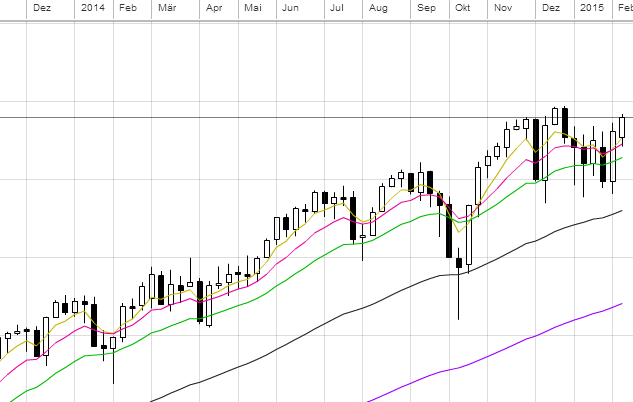 The market need to break the previous high for a possible re-test of the bracket top. 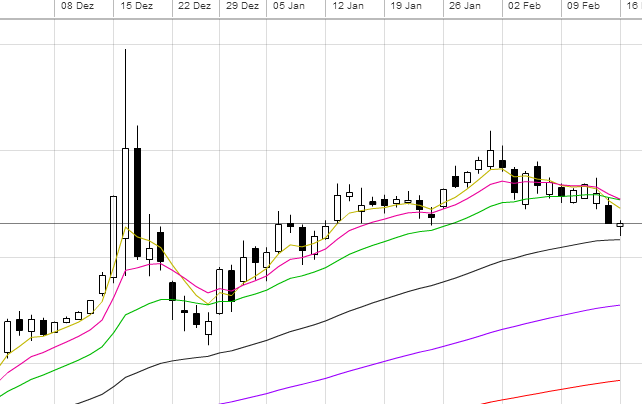 Observing the plain EMA chart, we can see the intact bullish short-term trend with support at the 20EMA (green line) level. 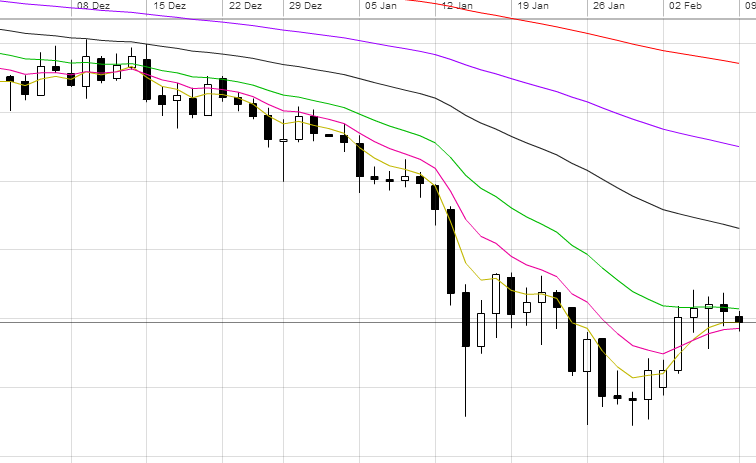 Today we opened above the 5EMA as well as the 10EMA but there wasn't much support. With all the mentioned informations here we could conclude a developing bullish market with a current balanced behavior in the daily bars perspective. 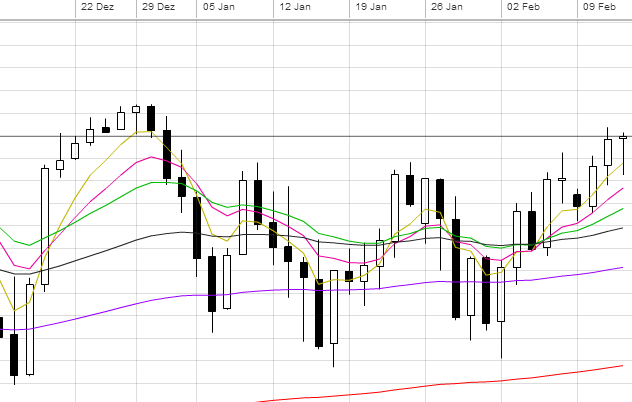 As mentioned a break higher should lead us to the daily bracket high. Everything can happen here, so be open minded and react to market generated informations. 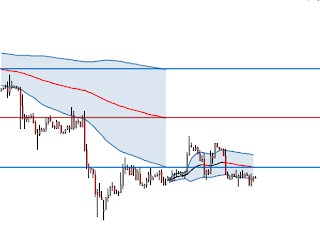 We could also extend our analysis process with the Time Price Opportunities (TPO) Profile or the Volume Weighted Average Price (VWAP) charts but more is sometimes less. Anyway, if you don't know about these tools please take a look into our trading glossary or visit our community to learn more. Welcome to February! 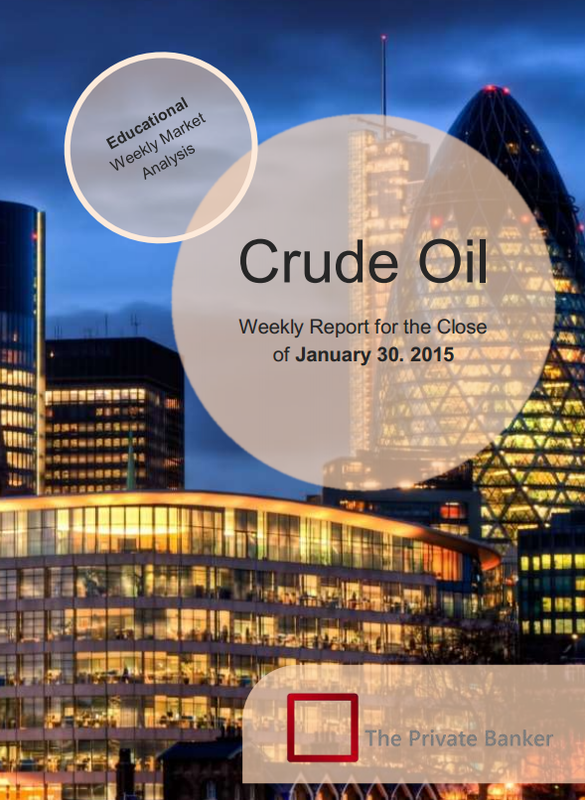 The weekly educational Crude Oil (Contract: CLH5) market report for for the Close of January 30, 2015 has been posted on our trading community. 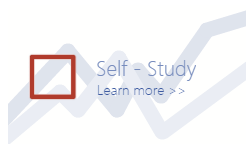 All members with an elite membership have free access to this reports every week. The report covers a weekly summary, market analysis, some thoughts about the COT report and with potential scenarios for the next week.